With an uncompromising attitude to please and exceed your expectations, your event or meeting in Singapore will be given our utmost attention at Park Hotel Clarke Quay. Located on the fringe of the CBD and only minutes away from Fort Canning and Clarke Quay MRT stations, Park Hotel Clarke Quay provides ease and convenience to your guests and delegates. The charming scenery of the Singapore River and pulsating night life of Clarke Quay provides a delightful point of interest and a tempting after-hours venue respectively. 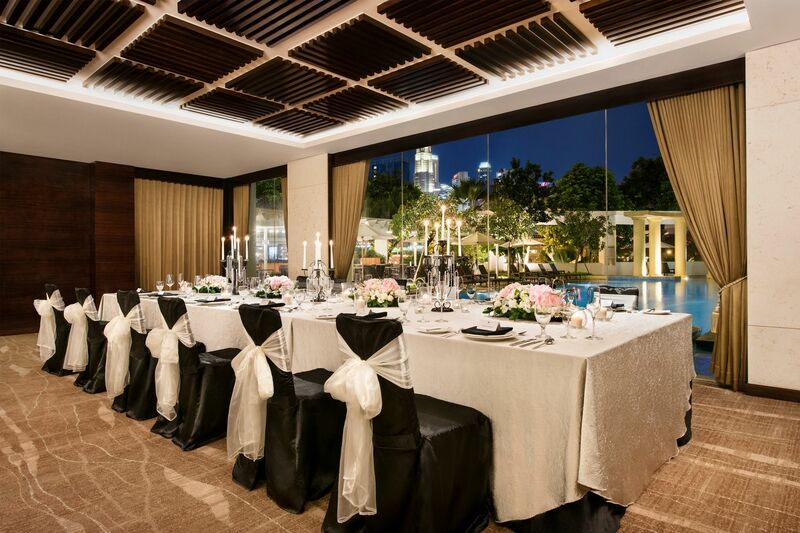 Elegantly decorated with a mother-of-pearl backdrop, the largest function room at this hotel in Singapore can accommodate up to 60 guests with views of the stunning pool and panoramic city skyline. You can also host your function in the sanctuary of the picturesque garden or pool deck for up to 70 guests. With comprehensive audio and visual equipment and exacting standards in service, our professional team will be on hand to ensure a seamless and successful event. Crowned as the Best Overall Indoor Solemnisation Venue (4-Star) at Her World Brides’ Venue Awards 2018, Park Hotel Clarke Quay possesses all the vital ingredients for hosting cosy and personal wedding celebrations. A harmonious blend of landscaped, poolside gardens with the charming Singapore River in the background, coupled with exquisite cuisines, ambience and customised service. On one of the most important events in your life, leave the finer details to our dedicated wedding specialists and bask in your moment, knowing that your wedding will be a true celebration of love with us. So come, take flight and celebrate love with Park Hotel Clarke Quay. Discover how you can host an intimate, cosy wedding soiree at our romantic indoor and outdoor venues at our Wedding Showcase on 20 July, 12 noon to 5pm. Fantastic lucky draw prizes await! Complimentary admission with pre-registration required. Down by the Singapore River and just steps away from a premier entertainment enclave- Clarke Quay, Park Hotel Clarke Quay offers the perfect inspiration to heat things up with the coolest celebrations. Hold a tropical-themed pool party by our stunning outdoor pool, complete with a sizzling seafood barbeque, or host an informal outdoor dinner reception where guests can mingle under the canopy of stars. If an indoor setting is your preference, our team is on hand to propose a suitable venue and assist in making your special occasion outstanding. Mark the milestones of your little ones with a blast in Park Hotel Clarke Quay! Be it a baby shower or a birthday party, our dedicated events planners will orchestrate a memorable party for your child. Our affordable and flexible packages offer you options of catering for kids and adults with activities and decoration for your convenience. For every moment worth celebrating, we deliver the finest outdoor catering option to transform your event into reality. Be it intimate or luxurious, what tickles your fancy? Let our team of dedicated catering specialists take charge, and work along with you at any venue or space of your choice. Savour the option to go local or truly global with a cosmopolitan dining experience with Park Hotel Group and an elevated event experience for your guests. Our expertise: Baby Showers, Weddings, Birthdays, Cocktails, Themed Parties, Corporate Events, Product Launches, Embassy Functions, Family Day and more. Get in touch with us now and we’ll customise a proposal that will meet your event needs with our outdoor catering services. Please contact (65) 6432 5515 or email catering@parkhotelgroup.com.